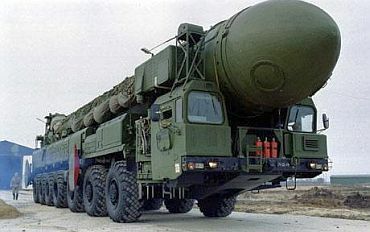 Rediff.com » News » Why should India cut nukes when US sits on a pile? Why should India cut nukes when US sits on a pile? Nuclear-free world - Rhetoric or reality? While the Washington nuclear summit was a good gathering of international leaders, nobody believes its joint declaration will ensure nuclear security, says Prakash Shah. If you thought earlier this year that a hopeful nuclear spring had arrived and our world is now closer to elimination of nuclear weapons, you would be forgiven. Last year, in Prague, the new young US President committed himself, at least rhetorically, to a vision of a world without nuclear weapons as an idea whose time had come. 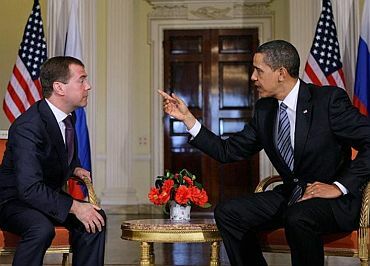 Earlier this year, President Barack Obama unveiled his administration's review of the US nuclear posture. There are some encouraging announcements in the nuclear review, such as the no-first-use of nuclear weapons policy against nations, which are members of the Non- Proliferation Treaty (NPT) and are in compliance with its provisions. STARTing on a new course? In the same week, US and Russia signed the new START (Strategic Arms Reduction Treaty), which has been touted as a major agreement involving deep cuts in nuclear weapons by both sides, and a step towards a nuclear weapons-free world. 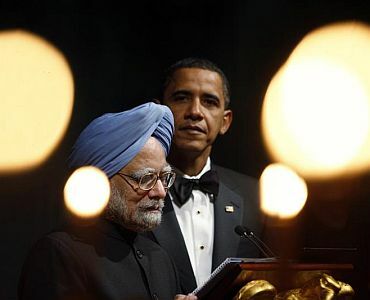 This was closely followed by a nuclear security summit held in Washington DC, where some 40-plus heads of government were invited, including Prime Minister Manmohan Singh. The primary purpose of the summit, held in April 2010, was to discuss and reach conclusions on nuclear terrorism and nuclear security. It was a follow-up to the announcement made by President Obama in Prague in April 2009 that nuclear terrorism is the most immediate and extreme threat to global security. The summit leaders agreed to do whatever was necessary to keep nuclear weapons and material safe. The five-yearly review of the NPT followed in New York. UN Secretary-General Ban Ki-moon had raised expectations about the NPT review conference making progress on disarmament, compliance with non-proliferation commitments and peaceful uses of nuclear energy. The conference did not live up to his expectations, but was considered another positive step in the heralding of a 'nuclear spring'. Ban actually announced further follow-up action: A UN conference to review implementation of the International Convention for Suppression of Acts of Nuclear Terrorism; a ministerial-level meeting to push the pace on bringing the CTBT into force; and negotiating a binding treaty on fissile material. Developments since April 2009 on the non-proliferation front moved even the normally docile UNSG to announce, "For the first time in a generation, we can be optimistic," presumably of achieving the Obama vision. Image: USS Ohio, strategic nuclear submarine of the US Navy. 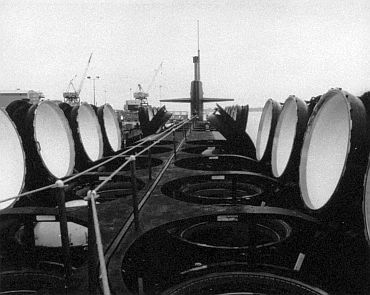 Commissioned in 1981, carries 24 Trident ballistic missiles in a double row of vertical launch tubes (shown with hatches open). The average patrol time at sea of Ohio-class submarines is 70 days, and their nuclear reactor cores need replacement only once every nine years. The reality, of course, is different. President Obama's nuclear review of US policy, where he says nothing about destroying all US nuclear weapons, clearly demonstrates how rhetorical and meaningless his vision of a world without nuclear weapons is. In his defence, we have to admit that announcements of India's principled policy to work for a nuclear weapons-free world by successive Prime Ministers since Jawaharlal Nehru were no less rhetorical and meaningless. In fact, India went on to officially acquire nuclear weapons in 1998 and has neither the intention nor the desire to give them up voluntarily. Why should India? If the US President can have a vision of a world without nuclear weapons, while continuing to sit on the world's largest arsenal of nuclear weapons, why should other nations not do the same? Weapons cuts without actually doing so? If the US administration looks at China-Pakistan nuclear weapons cooperation with benign neglect, why should India volunteer to give up its nuclear deterrent? The 2010 START treaty may be hailed by non-proliferation vested interests as a great step toward a world without nuclear weapons. But international nuclear experts have a different view. They estimate that US and Russia could together deploy 1,300 warheads more than the 3,100 ceiling imposed on them by the new Treaty. Pavel Podvig, a longtime Russian arms researcher, said: "They found a way of making reductions without actually making them." The US administration's real goal was to extend and update the verification and inspection regime from START, 1991, which expired in December 2009. The White House defended the new treaty by terming the so-called arms cuts "creative accounting". This is how Hans Kristensen, of the Federation of American Scientists, described the treaty's warhead counting mechanism: "It is totally nuts." John Bolton, the hardline nuclear negotiator of former President Bush, remarked that if US and Russia are basically at the same levels of nuclear weapons after the New START Treaty is ratified, then what does it do to the "soaring rhetoric" of a world without nuclear weapons? The optimism about the CTBT coming into force is equally misplaced. 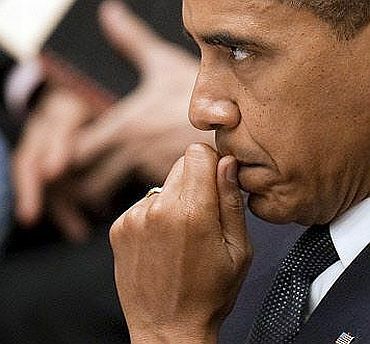 President Obama has not moved seriously to get the required Senate ratification, despite the US having signed it. Obama knows that the military-industrial lobby in the US is unlikely to allow the CTBT to be ratified by the Senate. India's foreign secretary made it clear that India's position on the CTBT is "well known" -- India will not sign it, as it is discriminatory. Without India and USA signing and ratifying the CTBT, it cannot come into effect. NPT review conferences are generally considered free holidays for member delegations. 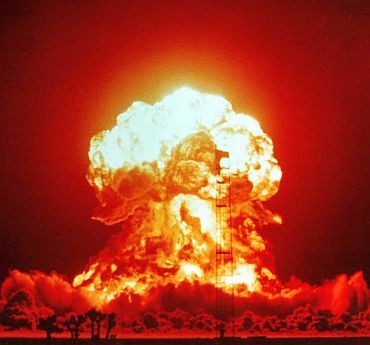 The NPT is an outdated treaty that contributes nothing to the vision of a world free of nuclear weapons. This year's review conference lived up to its reputation. The Washington nuclear summit was a good gathering of respectable international leaders, but nobody believes that its joint declaration ensures nuclear security. Pakistan's non-binding commitment is not taken seriously by those who are aware of Islamabad's propensity to support terrorism in its neighbourhood, which does not exclude intentional or unintentional nuclear terrorism. None of these international efforts is going to stop the China-Pakistan nuclear deal, despite it being in violation of NSG guidelines. China is determined to show to India who is the boss, after it was made to suffer the humiliation of approving NSG exemptions to the Indo-US nuclear Treaty. India's soft approach towards the China-Pakistan nuclear agreement for supply of two nuclear reactors, epitomised by its overzealous desire for bilateral talks, has convinced several NSG countries that India is not really serious about its objections. And despite its "strategic partnership" with India, US is not about to annoy either Pakistan or China by putting undue pressure on the NSG or the IAEA to stop this deal. Nor do these international moves affect Iran's nuclear ambitions, or solve the stand-off between US and Iran on nuclear issues. Obama's 'soaring vision': Rhetoric revisited! 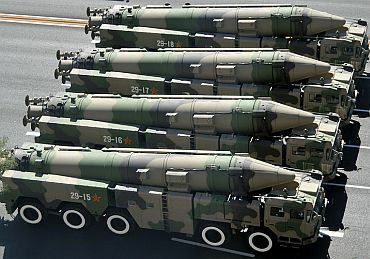 The US administration is yet to understand the link between Pakistan's acquisition of a larger nuclear arsenal with Chinese help and Iran's nuclear ambition. Iran fears that Pakistan, which now has about 100 weapons, and will get more with Chinese help, is not unlikely to provide them to Sunni countries neighbouring Iran. Iran believes that it requires a nuclear capability to meet the Sunni threat -- not just the Israeli threat. 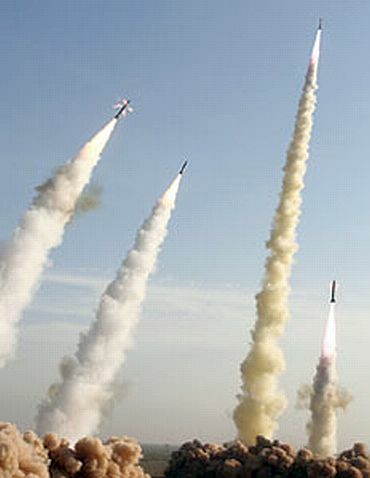 Talk of a pre-emptive US-Israeli strike on Iran is not only disastrous for our region; it is not in sync with this larger reality of Iran's perceived security needs. So, where does all this leave us on Obama's "soaring vision" of a world without nuclear weapons, a vision apparently shared by our prime minister? Rhetoric revisited!